While most children require a retainer after they've had braces removed, that isn't the only reason they may have one. Retainers are also used to help with other dental and medical issues, as well as speech problems. These apparatuses are custom made out of plastic and wire for the wearer, usually a child, but adults may require retainers as well. This is the most common retainer made for former braces wearers. It is a tongue-shaped piece that is made from acrylic and metal. It is made to fit into the mouth and the wire helps to hold the teeth into position. It is a simple design for its durability. This retainer can be adjusted for minor movements of the teeth. These retainers are becoming more popular, especially for older people who may have opted for braces as an adult. 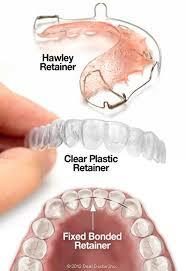 The clear plastic retainer is an aligner that helps keep the teeth in place. They are not as durable as a Hawley retainer and they are not recommended for people who grind their teeth or who have other similar issues. The Invisalign tray system is this type of retainer. A fixed retainer is used when the orthodontist is concerned that the teeth will try to move back into their original position after the braces are taken off. The retainer is bonded at the back of the teeth, so it is invisible, with a wire that holds the teeth in place. 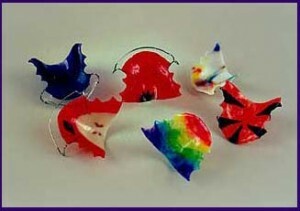 Unlike the other types of retainers, it cannot be removed, but it is bonded into place until it can be taken off. Although the Orthodontist may have a child wear their retainer during the day, it is more common for them to be worn at night. Although there will be a period of adjustment for the wearer to get used to it when sleeping, the retainer should only be worn at night. In order to keep a retainer safe and clean, when it is not in use, the retainer should be kept in its case. Retainers must be used for a lifetime to avoid the chance of the teeth shifting back.